The Central African Republic, part 1 dealt with my preparation for the trip and my time in Bangui at the start of my trip. This part deals with the main attraction: my time at Sangha Lodge in the country’s southwest. The morning after my trip to Boali Falls, William and Nestor picked me up and we drove to the airport to catch a puddle-jumper flight to Sangha Lodge, in the southwest corner of CAR. William immediately disappeared into the airport to do his fixing for two arriving clients, while I waited in the parking lot with Nestor. Me being me, I asked Nestor if I could pull out my binoculars and look for birds. Nestor approved, and I started trying to figure out what was perched on the fences and light posts around the airport. Many fences and lights surround the airport because it is one of the most strategically important and heavily fortified places in CAR. That means it’s also crawling with heavily armed UN soldiers and at least three tanks. The sight of a guy using a pair of high-powered binoculars to look at them (well, at the finch perched on the fence just to their left) did not please these soldiers, and Nestor quickly came running up to me to tell me he was sorry but I couldn’t do that. Binoculars and heavily armed soldiers just don’t mix. In the pilot’s seat of our little plane was a twenty-something South African man. His gave a casually self-assured delivery of the safety briefing and we were off flying over Bangui and then the rainforest. I was seated directly behind him, and - a nervous flyer at the best of times - my sense of alarm rose significantly during the flight when I saw him take out the extremely thick airplane manual and place it, open and face-up, in the space between the pilot’s and copilot’s seats. In order to reassure myself (surely he was just looking up something innocuous) I leaned forward and read the title of the page he had opened to: it was the page explaining how to restart the plane in the air following the failure of both engines. Alarmed, I spent the rest of the flight keenly listening to the sounds the plane was making*. Despite my apprehensions we landed safely in Baganga, the village at the entrance to Dzanga-Sangha National Park and close to Sangha Lodge. The owner of Sangha Lodge is a man named Rod Cassidy, and he was there to meet us at the airstrip along with his staff and many locals. Rod’s advice to me was to start birding right away, as the wildlife around the airstrip tends to be unique because the airstrip is a unique grassy area in the middle of a massive rainforest. There were no armed soldiers in sight, so I entertained myself trying to identify swifts (no easy task) while administrative issues were dealt with around me. I was initially hesitant when Rod told me to hand my passport over to a local official, but in the end I decided against wasting my day going with the official as he processed my entry into the region, and handed over the document. Common travel advice for Africa is to never, ever part with your passport. However, I find that this advice is almost impossible to follow. I had also handed my passport over to William upon arrival in Bangui, and he had then promptly disappeared into the bowels of the airport. Previous experiences with other fixers at African ports of entry have taught me that this is normal. My advice is to carry several certified copies of your passport; these will do in a pinch should your passport fail to be returned. Rod Cassidy (L), owner of Sangha Lodge, and me at the Bayanga airstrip. I was blown away by Sangha Lodge. The lodge is perched over the Sangha River, and on the first night we were treated to a river cruise. Big trees hung over the banks, monkeys occasionally causing a ruckus in the canopy. Parrots and hornbills flew overhead, presumably back to their evening roosts, and Rod regaled us with the story of the lodge and his past. He spent many years traveling across Africa as a birding guide, which was music to my ears! Sunset over the Sangha River from deck at Sangha Lodge. The lodge itself looks exactly like what you might expect - gorgeous but run-down in just the way a remote jungle lodge should be. The buildings were all distressed wood and blooming with moss and epiphytes. Flowering trees were starting to encroach on the lodge grounds. The main building had a comfy indoor common area decorated with local art and a bookshelf of books describing the local environment and culture. Attached was a gorgeous patio overlooking the river. Each “room” was its own little bungalow with a private bathroom (including a shower overlooking the river) and brand-new furniture. The main building’s common area at Sangha Lodge. The lodge used to be a hunter’s camp, as Dzanga-Sangha National Park is surrounded by hunting allotments. By purchasing the hunting allotment just north of the park, Rod and his partner Tamir have stopped all legal sport hunting in addition to creating a tourist attraction. Illegal poaching is an ongoing problem; a European hunting guide still sometimes takes his rich clients into the allotment, lying to the clients about exactly where they are. One evening I was there rifle shots range out from across the river; Rod immediately called rangers from the national park who came in a speedboat to investigate. Sangha Lodge from the river. The Sangha tour I was on included five activities (one per day). The first activity was a full-day visit to Dzanga Bai: the reason I have heard of this national park. As a child I remember staring at photos from Dzanga in my Dad’s National Geographic magazines. Dzanga is one of a collection of bais (small rainforest clearings) scattered through the rainforest in the region where CAR, Cameroon, and the Republic of Congo meet. Bais are special because they provide the best opportunities to see animals that usually stay hidden in the dense rainforest. For whatever reason, each Bai seems to attract a slightly different suite of animals, and Dzanga is famous for its elephants. After a fifteen minute walk through the rainforest I, the other Sangha guests, and our guides emerged at the base of a wooden observation platform about three stories tall. Our guides were very clear that we had to be extremely quiet - another reminder that we were in a remote location, visited only by a very lucky few. You can see elephants, albeit not the same species, easily on the plains and bushland of eastern and southern Africa, and there’s no need for quiet. Those elephants get so many safari trucks rumbling by that they are completely habituated to human noises. These elephants see very few tourists and are not at all habituated to human presence. Dzanga Bai from the top of the observation platform. The view at the top of the observation platform took my breathe away. Elephants – dozens of them – scattered around a clearing, doing various elephant things. Some had their entire faces submerged in the mud, others used their trunks to delicately transfer the mud to their mouths. Huge males congregated around the deepest mud pit, where their long tusks could scrape up the best mud. Young elephants ran around, flaring up their ears and trunks in mock aggression: sometimes at each other, sometimes at an unlucky heron, and sometimes at nothing in particular. Baby elephants stuck close to their mothers, venturing only short distances to play before high-tailing it back to safety under mom’s massive torso. A newborn (still pink) baby elephant finds safety and comfort under her mother’s massive body. The thing I enjoyed the most about the bai was watching new elephants arrive. Despite their huge size, elephants emerged from the incredibly dense rainforest seemingly by magic. One second there was nothing, and the next there was an elephant, without even the slightest sound or shake of a tree. Once the elephant emerged, other elephants would turn towards the newcomer and raise their trunks, seemingly sniffing the air to see who had arrived. The new elephant would amble forward, sometimes trumpeting or flaring its ears and trunk. Often it would amble towards what I perceived to be a friend, the two elephants would touch and entwine trunks, and then eat mud side-by-side. At the end of the day we left, creeping quietly down the stairs into the rainforest, where there was absolutely no indication that there were any elephants around, let alone the highest density of elephants in central Africa. The rainforest just swallows up the world’s largest land animal without a trace. Driving on muddy roads through the park, we had one last fantastic encounter: a big silverback gorilla on the road. As our driver slammed on the breaks the gorilla arched his back, flexed his massive muscles, and then disappeared into the forest. We saw him for maybe a second, but it was an incredible moment: I was in a place where gorillas are still common enough that you can happen upon them accidentally on your commute. The roads through Dzanga-Sangha National Park. Imagine this view but with a huge male gorilla blocking the road and flexing at you. Gorilla tourism, where you can visit a habituated gorilla group with professional gorilla trackers, is now relatively easy – if you can afford it. Uganda and Rwanda have really popularized this activity, and the habituated groups of mountain gorillas living in those countries are visited by tourists daily. Western lowland gorillas, despite being the most common of the gorillas, are by comparison much more difficult to see. Dzanga-Sangha National Park has two habituated western lowland gorilla groups that tourists are allowed to visit, and our second day’s activity was to visit one of these groups. Visiting wild gorillas is quite the experience: I was walking through the forest, turned a corner, and there was this huge, vaguely human, insanely muscular, hairy black beast sitting in front of me, maybe 50m away. Then I heard a crash to my left, a rustle behind me, and was surrounded by gorillas. These gorillas were not as habituated as the mountain gorillas. They snorted at us, gave us a lot of side-eye, and moved quickly through the forest. Spending an hour with them was unbelievably wild. A female gorilla checking me out. 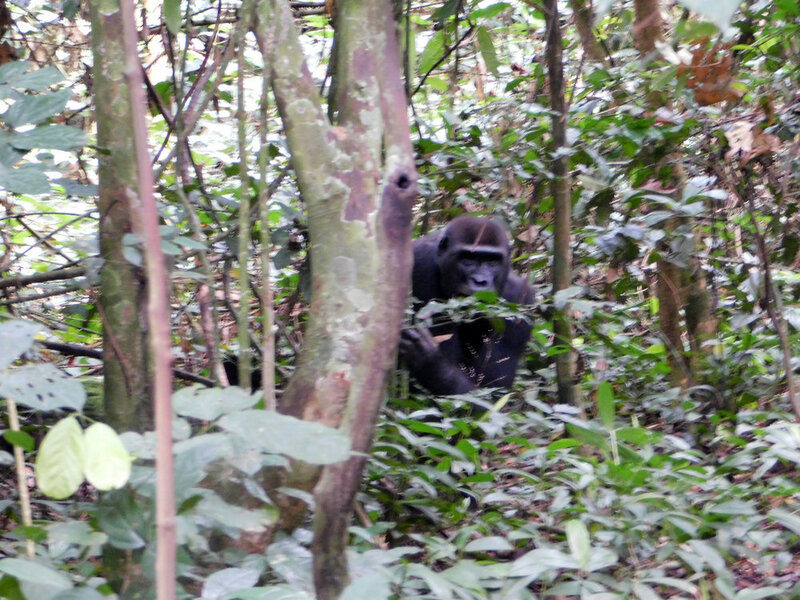 The silverback of the habituated gorilla group we visited. The third day’s activity was a hike to a waterfall to see some animals that, while not as well known, are weird central African specialties: anomalures, picathartes, and porcupines. 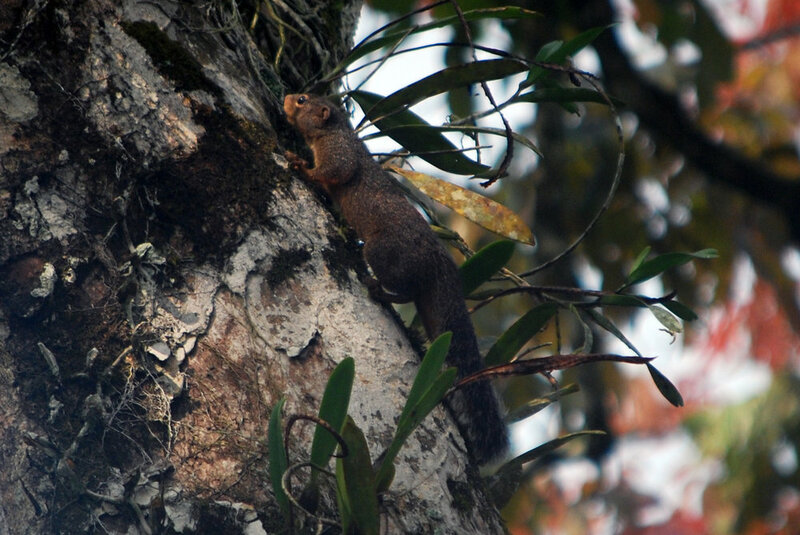 Anomalures are flying squirrel-like creatures endemic to Africa. There are only four species, three of which are found at Sangha. Rod has found a very old, very big hollow tree near the waterfall that is home to these weird critters. The tree is big enough that you can stand up inside it! Standing inside a huge, hollow tree, staring up at bats and anomalures. The waterfall itself was beautiful in that way that rainforest waterfalls are beautiful (and Boali Falls was not), but I wasn’t there for the scenery. The limestone rocks behind the waterfall are home to brush-tailed porcupines and grey-necked picathartes. There are only two species of picathartes, rare birds that are restricted to the central and west African rainforest. They also look completely bonkers, like the bird version of a rodeo clown. The porcupines were home, but only our guide got a glimpse of them as they ran deep into the limestone rocks. The picathartes were not home, unfortunately, though we did get to see some of their (unoccupied) mud nests. Rod had warned us that our chances of picathartes were small: a poacher had recently camped at the base of the waterfall, scaring the birds away. Hopefully they return next season! Unoccupied mud nests of grey-necked picathartes. The fourth day’s activity was hanging out with the local Ba’aka. Ba’aka are the indigenous peoples of the area, and are are often referred to as pygmies because they are very short. Traditionally discriminated against by governments and other local peoples, the Ba’aka are poor even by Central African standards. Nonetheless, they are renowned for their knowledge of the forest, and much of the staff and guides at Sangha Lodge are Ba’aka. Whenever we ventured into the rainforest, it was a Ba’aka guide who would lead the way and keep us safe (elephants were a particular danger). Usually this tour involves going hunting with the Ba’aka but I, and the other guest with me, were not super keen on this activity. Instead we got to hang out with some Ba’aka women, learning how houses are built from forest materials, and which plants are used for food and medicine. The most fun part for me, though, was the sheer joy these women exuded at behind asked to show off their skills. They sang songs the whole time, had huge smiles on their faces, and taught us to sing along as best we could. I often find anthropological tourism rather depressing and exploitative, and I generally avoid it. However, in this case I felt that these women were overjoyed to be earning some money showing off the skills they’d developed throughout their lives. I had so much fun, and I think they did too. Singing with Ba’aka women inside a newly-built hut. The last pre-planned activity was a walk through Bai Hokou. Like Dzanga Bai, Bai Hokou is a small clearing (actually a series of clearings) in the rainforest. Unlike Dzanga, however, Bai Hokou doesn’t have the special mud that attracts elephants, and so it is much safer to walk around. Nonetheless, elephants do regularly pass through Bai Hokou and we had, as always, a Ba’aka guide with us to keep us safe. Bai Hokou was beautiful, and our guides showed us interesting things like birds and an elephant skeleton. We also spotted a mother and fawn sitatunga: a rare marsh antelope with webbed hooves. Sitatunga do not visit Dzanga Bai, so Bai Hokou was our only chance to see them. Even here, though, they are not common, so we were very lucky. Wading with bare feet through the creek in Bai Hokou. This is not a recommended activity, next time I would bring water shoes or sandals. Me with what I think is an elephant hip-bone. The last full day didn’t have a pre-planned activity, so I decided to go back to Dzanga Bai. Again the elephants were the central draw (at Dzanga Bai the elephants are reliable) but the ungulates are a case of luck, and this time I was luckier with the ungulates, My first day at Dzanga the the only ungulate we saw was a single forest buffalo (but we did well on primates: black-and-white colobus at the bai plus mangabeys and moustached monkeys on the walk in). This time I did much better. 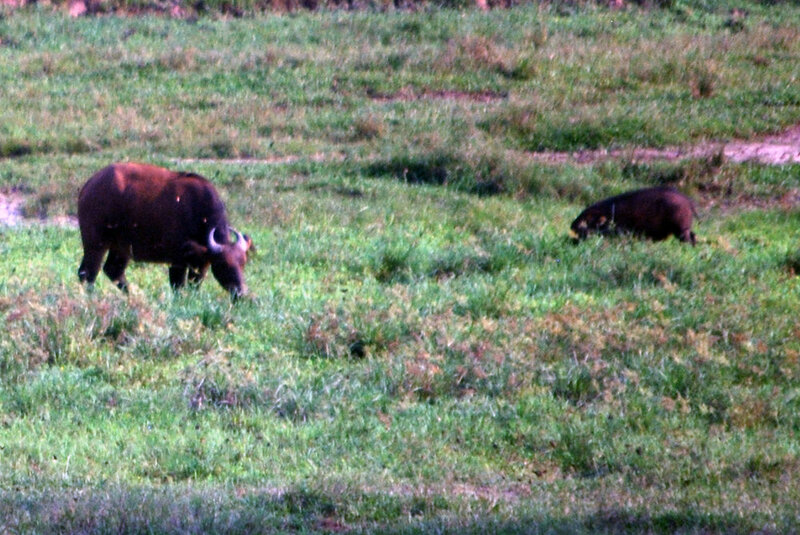 There were many buffalo in the bai, and some giant forest hogs (the largest pigs in the world) showed up in the afternoon. But right at 4pm, just as we had to leave, one of our guides pointed and whispered “bongo!” The bongo the largest Tragelaphusantelope, and considered among the most difficult of the African megafauna to see. It is also among the most beautiful ungulates in the world. Bongo inhabit only dense rainforest, and don’t generally come out into the open. 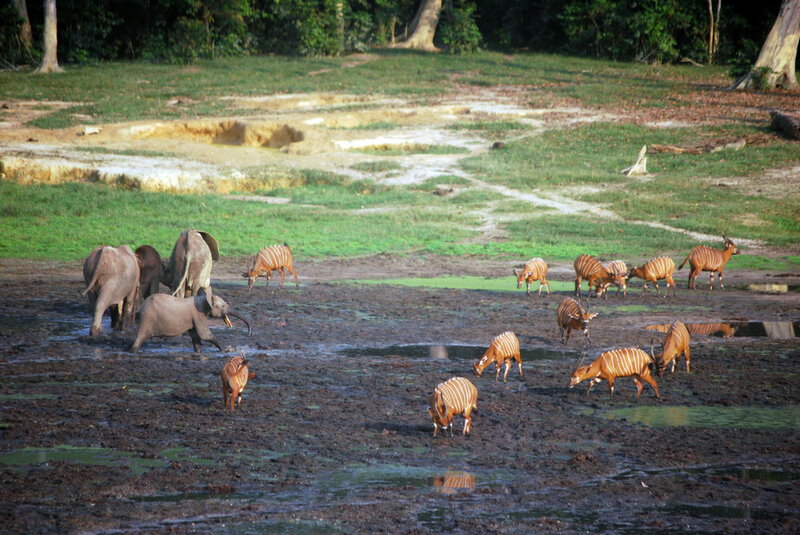 Dzanga Bai is the best place in the world to see wild bongo, and yet even here they are only an occasional visitor. Seeing fifty bongo emerge single-file from the forest – from huge males with spectacular spiral horns, to cute little calves – was a spectacular sight. We watched them graze and intermingle with the elephants until we just couldn’t delay leaving any longer. Once the sun goes down the prospect of surprising an elephant in the dark makes walking back from the bai much more dangerous. One of the most spectacular animal encounters of my life: elephant and bongo intermingling in Dzanga Bai. Between all the activities I did have some free time at Sangha Lodge. The area around the lodge is dense rainforest and Rod has set up a network of trails for visitors to explore. I was eager to get back to the lodge early after each day’s activity so that I could wander these trails. There are many animals to see around the lodge, the most enticing being the habituated pangolins. Rod employs pangolin trackers to monitor them from sunrise to sunset, and we got to hang out with the pangolins a few times. Pangolins are spectacular animals, and being scaled mammals are particularly enticing to a herper. It was immediately obvious why they are so hard to see in the wild, though, as even standing right under one, with an expert pangolin tracker indicating its exact location in the forest canopy, it was still very difficult to locate them. And it’s not like koala-finding; these things are constantly on the move, foraging for arboreal ant nests to rip apart. I do not envy the trackers’ job. A black-bellied pangolin foraging for arboreal ants in the rainforest. The rest of my free time I spent wandering the trails on my own, trying to find as many animals as possible. During the day, it was mostly birds and monkeys, though my most memorable experience was watching a huge swarm of army ants march across the forest floor, preceded by a flood of terrified (and usually doomed) insects, and followed by a flock of birds gorging on the ants. I continually had to monitor my own situation to make sure the ants were not surrounding me. I also wandered around at night. 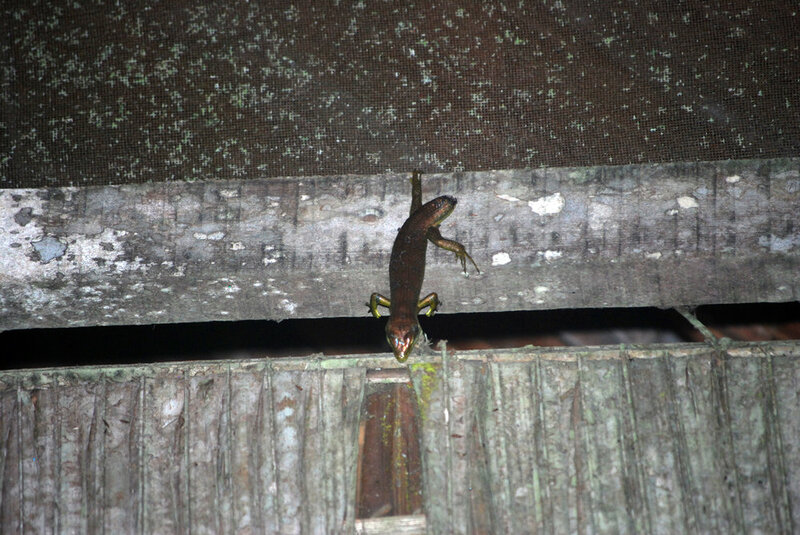 I treasured my nighttime walks because the wildlife, and even the atmosphere in the rainforest, changes completely. The easiest mammals to find were the night monkeys: bushbabies with their giant saucer eyes and swivelly, owl-like necks; and pottos, which look and act like right-side-up sloths. In terms of insects and other invertebrates, the night-time rainforest revealed a wealth of crazy colours, shapes, and sizes. 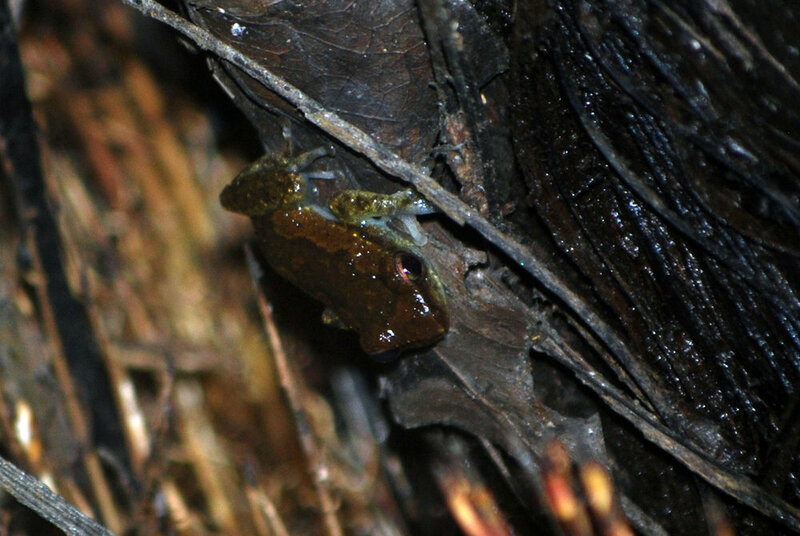 Frogs were quite abundant, their eyeshine making them easy to find. And the occasional rare treat made each night special: an owl one night, a crocodile or a snake another. It was a challenge to drag my tired self to bed each night so I could get up early enough the following morning to go birding. We had six full days at Sangha Lodge. On the seventh day our plane was late getting in, and I spent the extra time wandering around looking for last-minute critters. 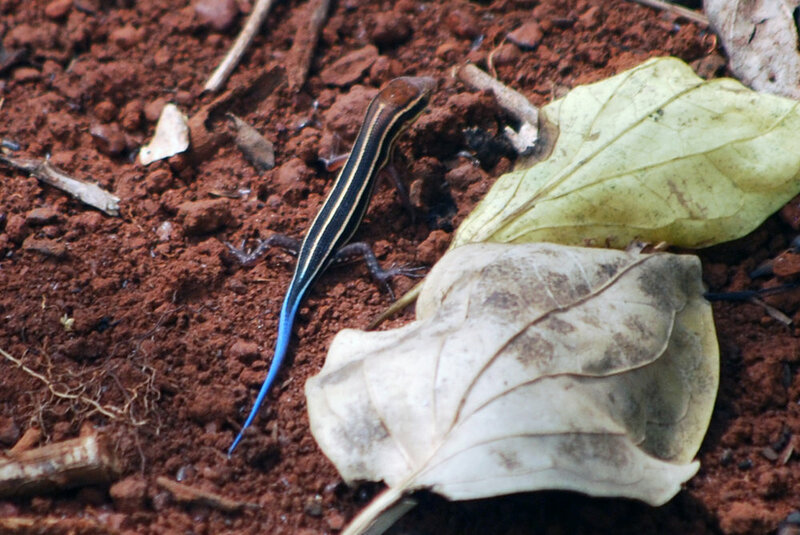 I was rewarded handsomely: searching the river’s edge produced a gorgeous baby ornate water monitor, and the alarm calls of a squirrel pointed me to a two-metre-long, bright yellow western green mamba basking in a patch of sun on the forest floor. Sometimes, delayed flights are the best! I had two nights back in Bangui, during which time Nestor, William and I explored the university, the parliament, and headed back to the Lac-des-Crocodiles road for more birding. I also visited the craft market for some souvenirs, and the diversity and quality of handicrafts available, in particular masks and other wood carvings, was just incredible. It was like visiting a museum where every artifact had a price tag. Visiting CAR as a tourist is not common – a UN employee told me, apparently sincerely, that some people might suspect I was CIA – but it is an immense privilege. The Faculty of Sciences at the University of Bangui. I got to have some interesting, if brief chats with some biology and anthropology professors here. *Later, back in Bangui after the trip, I was invited to a party hosted by the pilot’s girlfriend and I got to ask him why he opened the manual to that page. He told me he’s used to flying over the vast grasslands of eastern and northern CAR, where if you have a problem you can land the plane just about anywhere and deal with it on the ground. However, we had been flying over continuous, unbroken rainforest and there was nowhere to land. Out of an abundance of caution, he wanted the steps to restarting the engines in the air available at a moment’s notice. Flying over the central African rainforest is truly spectacular. Deep green canopy spreads out as far as you can see in all directions, broken only by the occasional river. I just wish I had spent less of the flight blinded by panic! One of the nice things about working in evolutionary biology (or any of the related, indistinguishable-for-all-practical-purposes Wild Thing Sciences) is that I was connected to a great number of cool people working on a great number of very cool creatures, in a great number of very cool places. Furthermore, the bureaucrats controlling modern-day Wild Thing Science are safety-paranoid enough that everyone doing "fieldwork" (working in the wild) must bring at least one buddy. That's one of the reasons I always brought volunteers on my trips, and why Wild Thing Scientists are constantly advertising for volunteers. If you're willing to work without getting paid there are many cool opportunities to work with a variety of wild animals worldwide. I know one evolutionary biologist who works solely on theory - all she needs to do her job is a working computer, essentially - but she travels the world going to exotic places and seeing incredible animals simply by tagging along with other biologists. It's actually an enviable system, as the "work" parts of fieldwork, like conducting experiments, collecting and preserving samples, and even just finding whatever animal you've decided you'd like to study, can be incredibly challenging, time-consuming, stressful and expensive. But tagging along on someone else's fieldwork? All the cool parts, none of the stresses! Dave (L) and me (R) wearing kilts at Dave's wedding. This was my first (and only) kilt-wearing experience. Dave is doing his PhD on Tasmanian Devils, one of the coolest mammals around. I took the opportunity to be a volunteer during his fieldwork, and for a week I got to go out every day and see Tasmanian devils in the wild! Dave is working in the far north-west corner of Tasmania, where the facial tumour disease is still spreading into healthy devil populations. If you haven't heard of the devil facial-tumour disease, and the destruction it has wrought on the world's last Tasmanian devils, check this out. Inside the trap, the meat is dangling by a string at the very back. The string is tied to a pin which is holding the door open. The devil enters the trap, grabs and pulls on the meat, the meat pulls the string, the string pulls the pin, the pin lets go of the door and the door falls, trapping the devil inside. A view inside a set devil trap, with the meat dangling from a string and ready for a big yank by a devil. There's a devil in there! There's a devil in there! Sometimes the initial excitement about a devil in a tube is unfounded: devils aren't the only predators prowling Tasmanian forests at night, and Dave sometimes has to deal with bycatch. If the bycatch is a tiger quoll, that's just icing on the devil's cake. Tiger quolls are another spectacular Australian marsupial currently going extinct, and getting to see one in the wild is just as much a privilege as seeing a wild devil. However, sometimes Dave catches feral cats, which are harbingers of death to native Australian animals and destruction to the Australian wilderness. Dave takes cats to be euthanized by a local veterinarian. Dave sometimes catches spectacular tiger quolls, like this one, in traps set for devils. Sometimes traps are closed with nothing inside. I like to think this is the result of Tasmanian tigers, because they'd be so big that they wouldn't fit completely in the trap, which would prevent the trap door from closing on them. More likely than not, though, it's due to trap malfunction or some other mundane explanation. If the closed trap proves to contain a devil, now, for better or for worse, you have a devil in a tube. This may seem like a challenge, and devils do have a reputation for being scrappy little balls of teeth and claws, but I learned by watching Dave that as long as you handle them with care and precision they're actually really calm. I watched Dave take measurements from a lot of devils and never once did one try to bite him or scratch him. This is as much to Dave's credit as a professional wildlife biologist as it is to the devil's relative docility: handling wild animals, especially ones with sharp teeth and massive jaw muscles, is not for the uninitiated. Due to the weight of the devil and the size of the trap, this requires two people: one of the many tasks for volunteers! Here's Dave measuring a devil. It'd be extremely cumbersome to both take and record the measurements while controlling and manipulating a devil-in-a-sack, so data-recording is another important task for volunteers. Tasmanian devil pouches: the pouch on the left belongs to a female without pups, the pouch on the right to a female with pups. Dave, and all Tasmanian devil researchers and conservationists, are very concerned about the potential for humans to spread the facial tumour disease between devils. Notice that Dave is wearing disposable latex gloves: those go into the garbage and are replaced in-between each devil. Dave and all the volunteers also use alcohol disinfectant gel in-between each devil just to be safe. A brand new burlap sack is used for each devil. And after the devil is removed from a trap, the trap is thoroughly washed and disinfected before being reset: another job for volunteers! 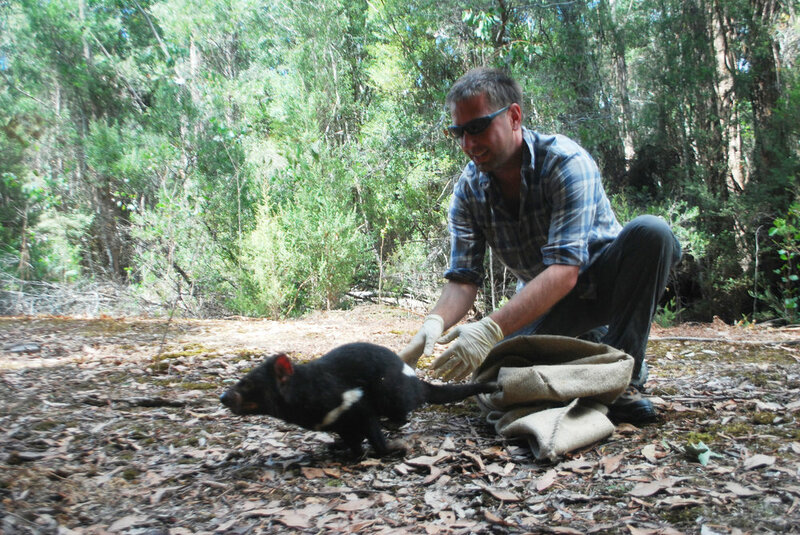 Helping Dave work with Tasmanian devils in the wild was an experience of a lifetime. And he's looking for more volunteers! A few days ago I posted an essay about my summer travels to conferences, linked by my incessant search for otters. Included in the post was a truly terrible picture of a platypus. The photo was taken from a platypus viewing hide in Yungaburra, Queensland, about an hour outside of Cairns. We sat patiently for quite a while at dusk, waiting for the platypus to show. By the time it did, the sun was so low there was not enough light to take a decent picture. Platypus aren't just easy to see in Yungaburra. Canberra, where I live, happens to be one of the easiest places to see platypus in Australia. At the Tidbinbilla Nature Sanctuary there is a boardwalk over a wetland where wild platypus are active during the day. With a little patience and, ideally, some binoculars, platypus can be viewed well at anytime. I thought I'd post some better pictures of platypus taken at Tidbinbilla to offset the terrible one I posted last week. I am not, however, a professional photographer, and professionals could get much better photos than these! Platypus are monotremes, the last mammals on Earth that lay eggs. 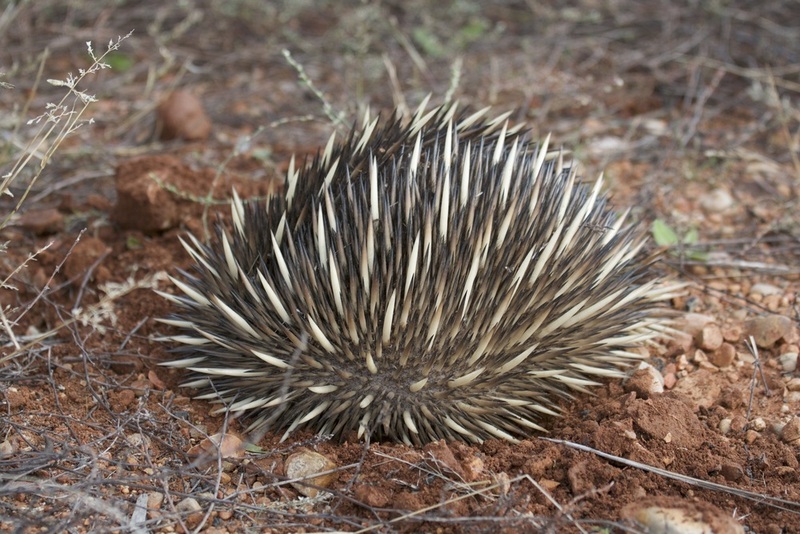 The only other monotremes still around are the echidnas, of which there are four species. Three are critically endangered animals that only live on the island of New Guinea, and the fourth is the reasonably common short-beaked echidna, which lives on both New Guinea and Australia. Canberra is also a great place to see echidnas, though they are by no means as easy to see as the platypus. Some of the best places to see them around Canberra are Black Mountain and Mulligan's Flat. 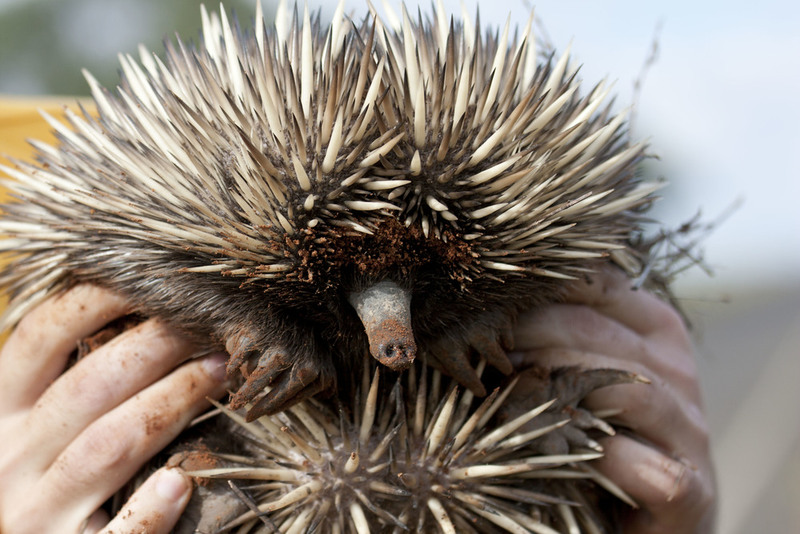 The Australian National University, where I work, is the only university in the world (as far as I know) that is home to both platypus and echidna, which is pretty special. Part of doing science is going to conferences where people present their research and everyone gets updated on the state of the art, as well as the identity of the artists. At an ideal conference a broad cross-section of researchers attends, from grizzled veterans who wrote their PhD theses on typewriters to undergraduate students who address everyone as Dr-so-and-so and generally act like they're attending extended office hours for their advanced biology course. This is what makes conferences so wonderful. Not only do you get to see the latest research, but you also get to meet people you admire from all professional levels at what approaches an even playing field. No polite knocking on office doors, no staying up until 1am to Skype with someone on the other side of the world. Last (Northern Hemisphere) summer I went on a 'round-the-world conference tour. This was made possible because three conferences I wanted to attend were taking place in the Americas in quick succession: the International Behavioural Neuroscience Society conference in Victoria, Canada at the beginning of June, the Evolution conference near Sao Paulo, Brazil at the end of June, and the International Brain Research Organization conference in early July in Rio de Janeiro, Brazil. Finally, the Behaviour conference was at the beginning of August back in Australia. Otters are charismatic members of the weasel family, Mustelidae. They're well known for their personable, funny behaviour such as sliding down waterfalls, play-fighting, and generally being pretty cute. When I was a kid my parents would take me to the Buffalo Aquarium, where their river otters were among my favourite exhibits, and I always loved watching them slide down their artificial river. Although otters are probably the most well-liked members of the weasel family, they're not the easiest things to observe in the wild. I'd been lucky enough to see wild otters only three times over the course of my life, despite North American river otters (Lontra canadensis) being native to my native southern Ontario. I'd seen the aforementioned river otters once in the wild, during a spring break trip to the Everglades in Florida. I'd also seen a neotropical river otter (Lontra longicaudis), a closely related species native to Central and South America, once while surveying birds in Panama. Finally, I got a fleeting glance at a family of spot-necked otters (Hydrictis maculicollis) on safari in the Maasi Mara in Kenya. That's three otter sightings in 28 years. I would get just as many sightings of otters in the two months I spent attending conferences across the Americas. Conference number one was the International Society for Behavioural Neuroscience (ISBN) conference in Victoria, Canada. Victoria is the beautiful capital of British Columbia, the westernmost province of Canada and is located on Vancouver Island. The conference was held at a particularly spectacular waterfront hotel in Victoria (picture below). Each conference has its own flavour, and the Behaviour Neuroscience conference was a strange mix of low-key and formality. The low-key aspect came mostly from the younger attendees, the graduate students and early postdocs. The conference started with a student-mixer, and I was surprised by how easy it was to meet new people and make quick friends amongst the students attending the conference. There weren't too many people and everyone seemed quite approachable and friendly. Smaller conferences and student-only mixers are good for this sort of thing. Meeting people is one of the main benefits to attending conferences, and the way this conference was organised really promoted getting to know people. The more formal aspect of the conference came from the more senior attendees. I find people working in neuroscience have a higher level of professional dress, in general, and suits, ties, pleated pants and dress shoes were common amongst the attendee's attire (notice all these items, save the shoes, are stereotypically men's formal wear; science is still very much a male-biased profession). The talks also felt more formal, both in their structure and their delivery. Behavioural neuroscience is a broad field to which I am only tangentially related. I would call what I do more evolutionary neuroscience or, if you want to get more specific, evolutionary neuroanatomy. I do try and relate my work to the behavioural work of others, but it's still not directly what I would consider "behavioural neuroscience". I like attending these conferences because they are significant horizon-broadeners. I come away from them feeling like I know better where I fit into the rest of the neuroscience field, even if nothing presented was directly what I work on. Victoria is a spectacular place to hold a conference, and my jet-lag resulted in my being awake bright and early, allowing for scenic strolls along the waterfront each morning before the conference started. Along Victoria's waterfront there's a particularly kitschy wharf where tourists can buy raw fish to feed a particularly friendly and obese seal (picture above). I'd heard that they've been having problems recently with sneaky otters stealing the fish meant for the seal. I wasn't so interested in seeing the seal, harbor seals (Phoca vitulina) are common along both of Canada's coasts and seeing one being fed by tourists didn't sound like a particularly wild experience. I was, however, very interested in trying to find the sneaky otters. Sea otters (Enhydra lutris) were, until recently, extinct in British Columbia due to over-harvesting for the fur industry. However, they had recently recolonised the coast of Vancouver Island and I was eager to see this endangered species in the wild. I walked down to the seal-feeding spot around sunrise, expecting to find some wily sea otters because, after all, this was the Pacific Ocean. However, I was surprised to find North American river otters instead! This just goes to show that you shouldn't make assumptions on the biology of animals based on their names. River otters can actually be found in lakes, streams, marshes and even coastal shorelines, as well as rivers. Because of my failure to find sea otters in Victoria, I joined some friends I had just made at the Behavioural Neuroscience conference on a quick road trip up to Tofino, a small town popular with hippies and surfers on the seaward coast of Vancouver Island. This trip was good for me because I was able to cement some friendships with people I had just met at the conference in Victoria. I came to the conference knowing only one person, and yet I was able to mingle, make friends, and establish new contacts, particularly with people at the same career stage as I am. I wanted to go to Tofino because it is a good place to see two mammals, both spectacular conservation success stories. In additional to the recently-recolonised sea otters, I was hoping to see Pacific Gray Whales (Eschrichtius robustus). The gray whales, or at least the population that lives along the Pacific coast of North America, is believed to be the first whale population to have completely recovered from whaling. The number of gray whales is what it was before humans started hunting all the great whales to extinction. Conservation success stories are relatively rare - much rarer than species in dire situations in need of conservation - and it's always nice to see a wild animal that represents human's ability not to kill animals, but to save them (as long as we care to). To have the opportunity to see two such species in one place is a rare treat. Unfortunately, it was not to be. The sea was too rough and we weren't able to get out to the rafts of sea otters, who live quite a ways out from shore. This caution on the part of our captain was definitely a good thing. Just a few months later a boat capsized and six people died doing exactly what I was doing. The gray whales, however, were also sheltering from the rough seas. They were in a (relatively) calm bay and we were able to see five of them up close, including a calf playing around its mother. The whales almost made up for the disappointment of missing the sea otters. The next conference on my tour was the Evolution conference in Guaruja, Brazil. Guaruja is a coastal resort-city get-away for the wealthier residents of Sao Paulo, Brazil's biggest city. It's also, I learned later from some Sao Paulo residents, not the safest place on Earth, or even in Brazil. Rumor had it that on the first day of the conference a few attendees were mugged, and it's the only conference I've ever attended with police and an ambulance stationed out front. Out of all the conferences I attended last summer, the Evolution conference had the most people I knew. Entire labs from my department (Evolution, Ecology & Genetics) at ANU were attending, and there were additional people from my department and from around Australia whom I was friendly with. It was surprising, therefore, that this was the conference at which I felt the most like an outsider. Many people come back from conferences, particularly conferences at which they are the only members of their lab in attendance, reporting feelings of isolation and loneliness. Although that doesn't necessarily have to be the case (see my experience at the last conference), it was my experience at this conference. When I think of the two conferences, and compare their structure and my experiences, I think a lot of the differences in my experience can be found in the size of the conferences, and in their organization. The Evolution conference was much larger than the ISBN conference, and had in attendance many more "Big Cheeses". The Evolution community is a relatively small one, however when everyone is at the same conference it can feel huge, and moreover most people are already friends with each other. I'm a relative outsider in the field of evolution, and I found this conference relatively cliquey, with most people sticking to their previously-established social groups and not much room for new interactions. This brings me to my second point. There weren't many opportunities for socializing set-up by the conference organizers. The ISBN conference's very first function was a meet-and-great for PhD students only, and those sorts of socials can help outsiders find their way in. In their absence, I was overwhelmed and lost. That's not to say I didn't meet anyone interesting. I made a point of looking people up and talking to them if their work related to mine or was something that I was particularly interested in. On a few occasions I was able to connect people with other people I knew who were interested in the same things, which I hope was useful. However I left the conference feeling like I hadn't been able to integrate or become part of the evolution society. Following the conference I decided to visit a place that was always very high on my "must-visit" list: the Pantanal in far western Brazil. Circumstances had conspired to force me to miss the Pantanal on both my previous trips to Brazil, and I wasn't going to let that happen again! I rented a car in Cuiaba and spent a week driving up and down the Transpantaneira, the only road that penetrates deep into the Pantanal, looking for animals. The Pantanal is not the Amazon. It's a giant, flooded grassland very similar to the Everglades. The Amazon is full of animals but they are very difficult to see owing to all the massive trees that are in the way. 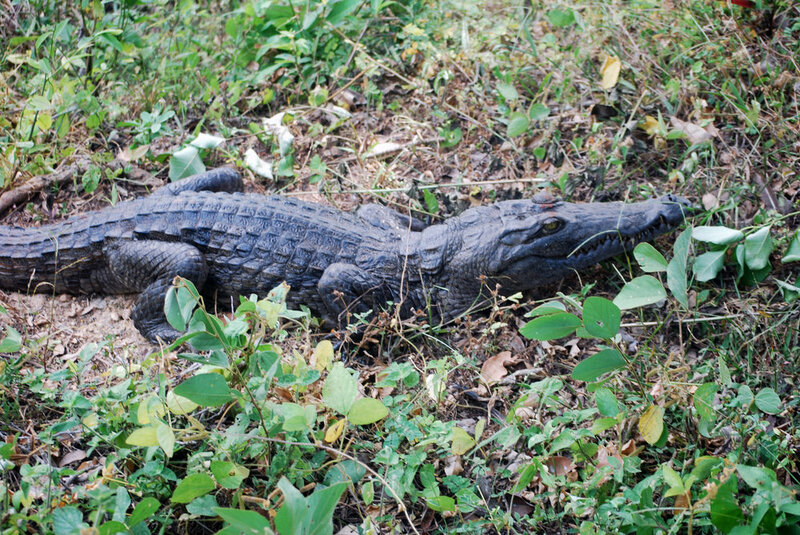 As a grassland, the Pantanal is a much easier place to see animals, and it is well-known particularly for mammals. I went to the Pantanal seeking four animals in particular: hyacinth macaw, lowland tapir, jaguar and giant otter (Pteronura brasiliensis). The Pantanal is definitely the best place to see all four, and the only place to reliably see hyacinth macaw and jaguar. 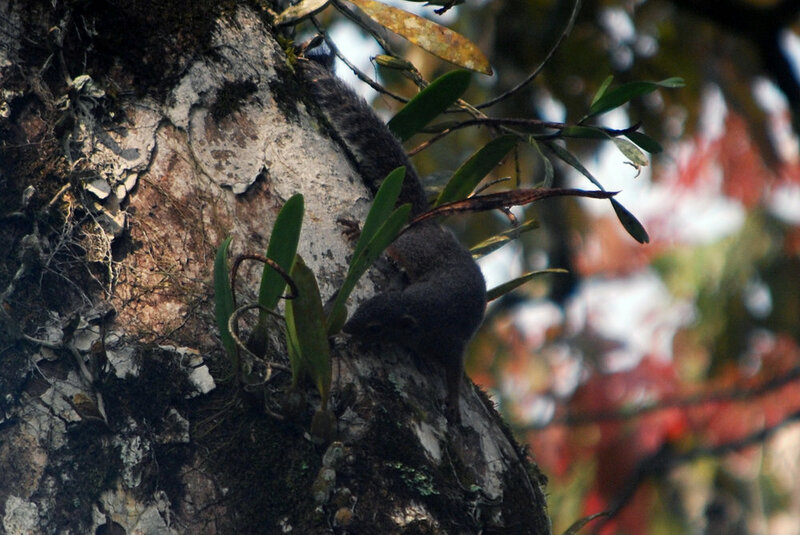 To find jaguar and giant otter I drove to the small village at the end of the Transpantaneira called Porto Jofre. Porto Jofre is idyllically located on the bank of the Cuiaba River. There's a campground there, and I have to admit that camping on the edge of the river looked pretty spectacular, especially as the sun went down. However, after dark I discovered the dark side of this particular campground. For no discernible reason the campground had massive lights that bathed all the campsites in artificial light all night long. To power these lights they ran a diesel generator, a very noisy machine, for the WHOLE NIGHT. What could have been a spectacular experience listening to the river flow as I fall asleep admiring the stars through the mesh of my tent turned into a horrible experience in which a face mask and earplugs were necessary to get any sleep at all. One of the benefits of the generator was that I had no trouble getting up in time to watch the sunrise. I also discovered that there was a giant river otter den right next to my tent. I got to watch four of the massive animals play and catch fish as the sun rose and I drank my morning coffee. Giant river otters are not only the longest of the otters, but are the longest of the Mustelids, and can get almost 2 meters long! They are huge. Unfortunately, I was not nearly as lucky with the jaguars as I was with the otters. I hired a boat to take me looking for jaguars all day on the banks of the Cuiaba River. Porto Jofre is known as the only place in the world to reliably see jaguars in the wild, but even there it's not easy. The jaguars are seen when they come to the banks of the river to sunbathe, drink, hunt and bathe. They often don't hang around very long, so the trick is to be in the right place at the right time to see them. Working to the advantage of hopeful jaguar-spotters is the sheer number of people who want to see them. Many boats patrol the river ever day, looking for jaguars. If one is seen, the driver of the boat that spotted it gets on the radio and lets all the other boats know where it is. All the other boats race over to where the jaguar is to try to get a glimpse of it before it disappears back into the bush. Two jaguars were spotted the day I hired a boat to go looking for them. Unfortunately, I had not thought about horsepower when I hired the boat. My boat had the weakest horsepower motor available (60 hp, I think) and it was depressing watching all the other boats zoom past us on the way to see the first jaguar. My boat was left far behind and by the time we got to where the jaguar had been, it was long gone. By the time the second jaguar appeared, in the late afternoon, we had already run out of petrol and had returned to Porto Jofre. Credit to the driver of the boat, though, he really tried to find that jaguar. He searched for so long that we ran out of petrol in the middle of the river and had to wait for more to be brought from Porto Jofre. Hiring that boat cost R$600, more than I was expecting. I would have hired a (faster) boat again the next day, but I hadn't taken out enough cash before heading down the Transpantaneira. There is no ATM, and no credit card facilities, in Porto Jofre. After a week in the Pantanal I flew to Rio de Janeiro for my second Brazilian conference, the world congress of the International Brain Research Organization (IBRO). On paper, this conference and the last conference I attended, Evolution, were very similar. Both were large international conferences put on by big academic societies in large Brazilian cities. However, they couldn't have felt more different. I think the major difference between the two stems from their relative importance to their fields. The Evolution conference is probably the biggest, most important conference in the field of evolutionary biology (though there are other conferences that would argue this point, it's definitely one of the biggest). Because of this, I think it attracted a great majority of the players in evolutionary biology from around the world. Had the conference been held in America, Europe or Australia, most of the same people probably would have shown up. The IBRO conference, by contrast, was noticeably made up of mostly researchers from Brazil and around South America. I think this is because the IBRO conference is definitely not the principle neuroscience conference. That would be the annual Society for Neuroscience (SfN) conference, which takes place every year in one of three American cities and attracts over 30 000 attendees. The IBRO conference was big, but not even close to THAT big. I also think it has to do with the number of people in the field. Neuroscience is one of the largest academic fields period and so the pool of people that can be drawn on to attend the conference is huge. Evolutionary biology is a much smaller field and even its largest conferences struggle to have an attendance a tenth as big as SfN. So a neuroscience conference could be decently sized and still only host mostly researchers from South America, while an evolution conference of only South American attendees would be noticeably smaller. Not that that's necessarily a bad thing; many people prefer smaller conferences and I know lots of people who refuse to attend SfN due to its overwhelming size. I really enjoyed the IBRO conference. The only neuroscience conference I regularly attend, SfN, is dominated by North American and European researchers, and it was great to see all the interesting but relatively unsung work that's being done in South America. Rio de Janeiro is also home to one of my favorite research groups, the lab of Prof. Suzanna Herculano-Houzel. This lab is consistently coming out with cool research in the field of evolutionary neuroscience, and is one of the few labs in the world doing so. Dr. Herculano-Houzel herself is an excellent speaker and advocate for Brazilian academia, and has written several books on neuroscience-related topics in Portuguese. I am lucky to be friends with several of the people in her lab and was invited to her lab's celebratory dinner before the conference's closing party. In addition to Dr. Herculano-Houzel's lab I got to visit with a future lab-mate. It's always nice to make friends with lab members before joining a lab, as joining itself can be a jarring and disorienting experience. It's nice to have people that already know you and can help you adjust. It was weird, and a shock to the system for me, that two conferences that looked so similar on paper, held in almost the same place and only one week apart, could have produced such opposing experiences for me. After the IBRO conference it was time to head back to Australia for the final conference on my tour, the Behavior conference in Cairns. The only flights from South American to Australia are from Santiago, Chile to Sydney, Australia. I could have gotten a flight from Rio to Santiago, but they are shockingly expensive and the flight from Santiago to Sydney was already expensive enough. Instead, I got a much cheaper flight from Rio to Santa Cruz de la Sierra in Bolivia, and spent the next two weeks traveling overland to Santiago and my flight home to Australia. I think that entire two-week trip cost less than the Rio-Santiago flight, and produced many more memories. Some of those memories were produced at the Humboldt Penguin National Reserve north of La Serena, Chile. The reserve is not only an excellent place to see Humboldt penguins (of which we saw several) but is also probably the best place north of Santiago to see one of the world's least know otters. The sea otter of North America is the most well-known otter-that-lives-in-the-sea, and it's the only one that has a truly pelagic existence, where it needs little to no contact with the land to survive, but there is another otter species, much less well known, that lives primarily in the sea. The marine otter (Lontra felina) is native to the Pacific coast of South America and lives in the littoral zone (the area close to shore) of the coast. It's very specialized to this area and rarely enters fresh or even brackish water. And yet it looks almost identical to the two American freshwater Lontra otter species. That it's internationally listed as endangered just adds to its air of mystery. Seeing the marine otter in the wild was an excellent way to end my overseas conference tour that started with a failure to see the sea otter. The final conference on my tour was the Behavior conference in Cairns, Australia. Sadly, Australia is otter-free, the closest otters living across Wallace's Line in places like Borneo. However, I went to Cairns the weekend before the conference to try and see some of the cool wildlife that does live there, such as tree-kangaroos, green ringtail possum, and golden bowerbirds. To see these animals I travelled to a town not far from Cairns called Yungaburra and hired Alan Gillanders of Alan's Wildlife Tours to help me find these amazing but hard-to-find critters, which we did successfully. Particularly spectacular was the nighttime spotlighting portion of Alan's tour. Rare possums and gliders were illuminated in bright red light from special spotlights. Red light is used instead of normal white light because the possums and gliders can't see it, and so are not disturbed by our tour. However, one animal that I didn't need Alan's help to find was Australia's version of an otter, the spectacular platypus (Ornithorhynchus anatinus). Yungaburra has its very own platypus hide, and at dusk I visited it along with some backpackers and was able to watch as a platypus emerged from its burrow for its nighttime forage. Now, platypus are very easy to see in the wild in Canberra, where I live, but it's shocking to see just how much smaller they are up Australia's north compared to the south. Up in Yungaburra they're like adorable mini-platypuses. After my wildlife tour it was time for the Behavior conference. Behavioral ecology and evolutionary biology are ostensibly different fields, but the people who do them are generally interested in both to the point that I don't think I could tell the attendees of the Behavior conference from the attendees of the Evolution conference in Guaruja based on research topics. Interestingly my experience at the Behavior conference was the opposite of mine at the Evolution conference. At Behavior I felt integrated, got to know people, and had great conversations with a wide variety of people about lots of science topics, including with people that I had not known previously. Here, I think the big difference was that I not only had friends in attendance, but also more senior academics who knew me and had an interest in my academic progress. In particular, my co-supervisor Prof. Martin Whiting, chief of the Lizard Lab, was in attendance. Martin made sure that I met people who had interests relevant to mine and opened doors in terms of talking to the right people. And it wasn't only him. Other senior academics in attendance were great in helping me meet people and feel included in the society. This made me realize how important it is to have good supervisors. Especially in the absence of the right social functions at conferences, they are key to meeting the people you need to meet as an early career researcher in order to become part of the academic world. After the Behavior conference my tour was over. I had to get back to my office, to the grind of analyzing data, making sense of the results and writing papers. However, at the same time my partner got her first taste of conference travel when her supervisor sent her to a conference in the United States. After the conference she went to visit her aunt who has a house near Monterey Bay, California, and low-and-behold she sent me the picture below. They may just look like little specks in the ocean, but she made sure I knew what they were: real, live sea otters!